Boost productivity, streamline store buying and receiving. Our retail buying software allows you to efficiently create and manage purchase orders and when shipments arrive, receive items quickly and accurately. Enter products and create orders from anywhere. Bring your iPad to market! Support your unique retail business by creating any custom SmartField you need. Open API lets you integrate with ordering platforms like Joor or NuOrder. Customize our robust purchasing reports to drive your retail planning strategy. Our purchasing and receiving tools save you both time and money. How? By reducing friction, enhancing efficiency and supporting your unique retail buying strategy. 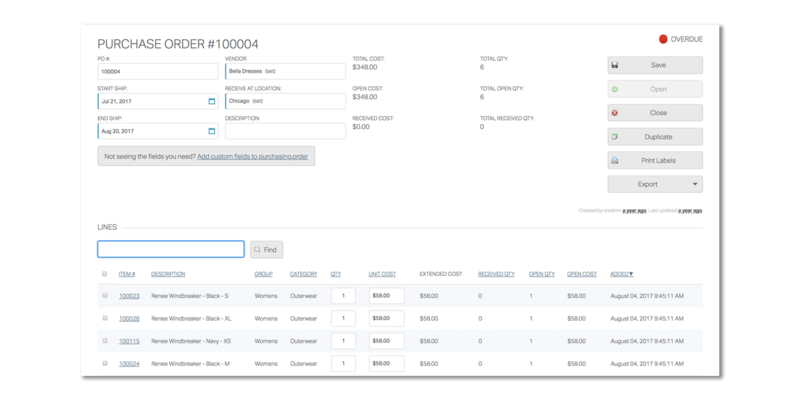 Create a retail purchase order easily from anywhere. Bring your tablet to market and enter orders on-the-go. Check your projected margins and adjust the PO as needed. And, once the shipment arrives, pull out your scanner or use the handy check boxes to receive items into the system efficiently. Simple yet smart tools to help you sell more, profitably. "Today I was able to use Springboard to set up a new vendor and write a Purchase Order on the spot—this saves tons of follow up at the close of the show and means immediate shipping for new product! I'm in heaven!" Retail is evolving. With unprecedented choice, a myriad of ways to shop, and a desire for fresh product at every interaction, retail buyers must be at the top of their game. Enhance your retail buying with purchasing tools built into your POS and use data to efficiently optimize your strategy. See a complete list of our POS and retail store management software features. Build POs in Springboard directly in the application or import a spreadsheet. Need a specific field on your purchase orders like terms or season? No problem, you can create any field you want. Even better, report on these fields specifically, ie. see understocked or overstocked items by season. Receive items easily by scanning barcodes or use the checkbox to accept items manually. Reduce errors with auto-alerts about possible discrepancies and if you need to make a return, you can quickly create and complete return documents within Springboard Retail point of sale software.